Like the other 300 plus communities that Kevin Smith Transportation Group services, Mount Airy Philadelphia, PA appreciates the engagement that only a local company can deliver, With operations based across southeastern PA including Berks, Bucks, Mount Airy Philadelphia, Delaware and Montgomery Counties and the entire Philadelphia, PA area, KSTG is the obvious choice for every person and business in Mount Airy Philadelphia, PA.
For individuals and companies based in Mount Airy Philadelphia, PA who have a need for either Leisure or Corporate Transportation services, Kevin Smith Transportation Group is the only solution you need. KSTG’s Leisure division will often be seen sending out a Wedding Limo or Call on most weekends. Wedding Shuttles can be seen every weekend in Mount Airy Philadelphia, PA, moving everybody from Bridal Parties to Wedding Guests, making sure everybody can celebrate safely without the worry of figuring out how they will get back to the hotel safely. If a Party Bus rental is on your list, let KSTG arrange the perfect vehicle. Looking for something more elegant like a Stretch Limo and have KSTG send one of our Luxury Limos to Mount Airy Philadelphia, PA and pick you up. Ideas may arrange for that landmark birthday celebration to simply a bar crawl with a group of life-long friends. Whatever the need, if your night is starting or ending in Mount Airy Philadelphia, PA, let Kevin Smith Transportation Group deliver you in style. Almost every business in Mount Airy Philadelphia, PA will eventually have a need for professional Corporate Transportation services. It may be a one-time request for that VIP client to daily shuttle services moving employees back and forth from a regional rail station. Whatever the need, Kevin Smith Transportation Group’s fleet of Black Vehicles from Yukons to Cadillac’s are the perfect choice for those focused on Luxury and Quality. Airport Transportation is a common service request with Philadelphia International Airport (PHL) located so close to Mount Airy Philadelphia, PA. With more than a dozen International Airports in the Mid-Atlantic area, many companies will utilize KSTG’s services for Airport Transportation to places like Newark international (EWR), Kennedy Airport (JFK) and other airports north and south of the Mount Airy Philadelphia, PA area. Other that Kevin Smith Transportation Group offers companies in Mount Airy Philadelphia, PA include Shuttle Services. 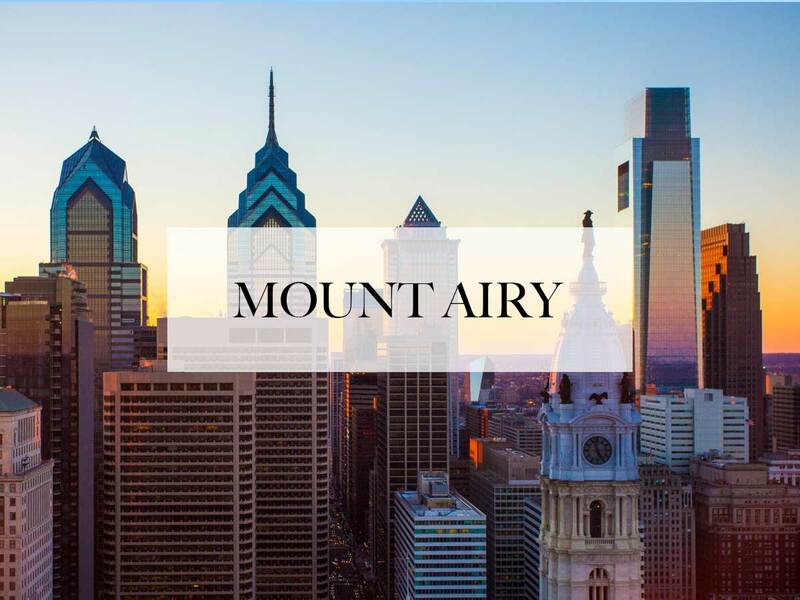 What makes companies great in Mount Airy Philadelphia, PA is their ability to recruit the best talent. That often means recruiting in non-traditional markets. With KSTG’s Shuttle Services, many companies today have expanded their target markets to locations up and down SEPTA’s regional rail lines, providing employees with an easier commute. After a long day at work, getting a chance to relax in the back of a KSTG shuttle and being dropped off at the rail station for a traffic-free commute home is setting apart those companies in Mount Airy Philadelphia, PA who are leveraging this employee perk. In addition, many companies in Mount Airy Philadelphia, PA have employees or clients who will be traveling from outside the region. Whether it is Philadelphia International Airport or a local FBO like Wings Field, Northeast Regional Airport or Doylestown Airport, KSTG has a fleet of Luxury Cadillac XTS’s and Black Yukon’s to make sure your visitors are delivered on time and safely. Most companies in Mount Airy Philadelphia, PA have begun to institute strict Duty of Care requirements around ground transportation, not allowing their employees to use any unregulated apps. This means that a company like Kevin Smith Transportation Group, with a highly skilled, licensed and screened staff of chauffeurs, becomes the perfect option for any company in Mount Airy Philadelphia, PA who wants to offer their employees a safe and reliable transportation option. Black Car service is more than just a late model black vehicle. It is about providing a custom chauffeured experience where safety and luxury don’t have to be sacrificed. Mount Airy Philadelphia, PA has been a key contributor to the success of Kevin Smith Transportation Group. An award winning company since its inception, KSTG delivers daily to both individuals and companies across Mount Airy Philadelphia, PA. So whether it is that once in a lifetime event that needs to be perfect or just a routine trip to the airport, let KSTG be your total ground transportation solution. Today, KSTG is Mount Airy Philadelphia, PA’s #1 Transportation Company and as we continue to grow, the entire team at KSTG is excited to see where that success will take us. So for those who use us regularly or just once a year, thank you for making KSTG the company it is today. Mount Airy is a neighborhood of Northwest Philadelphia in the U.S. state of Pennsylvania. William Allen, a prominent Philadelphia merchant and Chief Justice of the Province of Pennsylvania, created his summer estate and mansion on Germantown Avenue at Allens Lane in 1750, and the area eventually took the building’s name, Mount Airy, as its own. Before this, the area which makes up the modern neighborhood of Mount Airy was part of two sections of the original Germantown Township (which covered all of Germantown, Mount Airy, and Chestnut Hill), Cresheim and Beggarstown. The village or Dorfshaft of Krisheim (also known as Cresheim) has its origins in the original land divisions of Germantown Township in 1689. It was a section of the township that was allotted to a group of original Germantown settlers who acquired rights to land either directly or indirectly from William Penn. It covered the area from Stenton to Wissahickon Avenues and from Mermaid Lane to roughly Sedgwick Street. The name is derived from a town known today as Kriegsheim in the Palatine in Germany which was the hometown of a few German Quaker families who had settled in Germantown in the 1680s. Throughout much of the 18th century, this area of Germantown Township was known in the land and tax records as simply Cresheim or Cresham. It was at the beginning of the 19th century that the name Mount Airy began to replace Cresheim. Beggarstown (also Beggars-town or Beggar Town), an area centered along Germantown Avenue between Gorgas Lane and Cliveden Street, was formed out of the so-called “Sidelands” of Germantown. The Sidelands were a section of Germantown Township that had been set aside so that the owners of lots in the center of Germantown could have access to an equal share of land in the entire village of Germantown section of Germantown Township. The portion from which Beggarstown grew covered the area from Upsal Street to roughly Sedgwick Street, Stenton Avenue, and Wissahickon Avenue. As the Germantown village filled up, settlers began to move northwest along Germantown Avenue. By the 1730s and 1740s, the Sidelands area was subdivided into smaller house lots. An account published in 1770 states that the area received its name as a result of its first resident’s begging for money to build his house, which later became the home of the Germantown Church of the Brethren. The name for this area disappeared by the late 19th century, and it was sometimes called Pelham, Germantown, or Mount Airy. The USPS does not officially correlate neighborhood names to Philadelphia ZIP codes (all are called simply “Philadelphia” or “Phila”). However, the 19119 ZIP code is almost entirely coterminous with the cultural-consensus boundaries of Mount Airy. There is no official boundary between Mount Airy and Germantown. The most common consensus is that Johnson Street is the de facto boundary; however, the West Mount Airy Neighbors and East Mount Airy Neighbors organizations consider Washington Lane to be Mount Airy’s southern edge. The question is moot, however, as the two neighborhoods blend together very gradually. Historically, the entire area was part of the German Township. Many buildings in Mount Airy carry the identity and even the name of Germantown in one way or another. For example, the Unitarian Society of Germantown, the Germantown Jewish Centre, the Germantown Christian Assembly, and the Germantown Montessori School are all in Mount Airy, yet also belong culturally to Germantown. Parts of the Battle of Germantown in 1777 occurred throughout Mount Airy. The special relationship linking the two has its roots in the time before the Act of Consolidation, when Germantown was a borough separate from the City of Philadelphia, and its rural environs were what is now Mount Airy.